Cancers of the pancreas are divided into groups according to the type of cell the cancer has arisen from, and to a lesser extent their position within the pancreas. 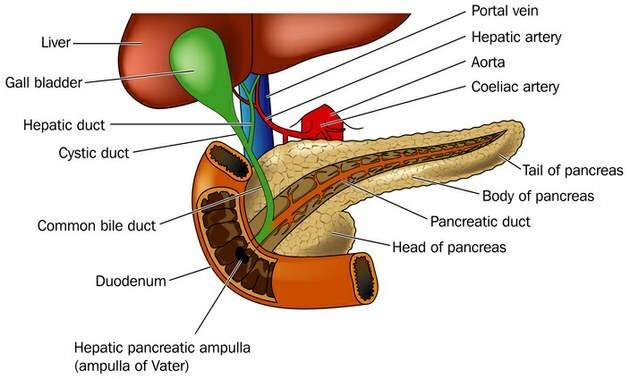 60% of pancreatic cancers arise in the head of the pancreas, 15% in the body, and 5% in the tail (see diagram). Cancers of the pancreas are usually hard, grey-white, poorly defined masses. A broad spectrum of tumours can arise in the pancreas, many are cystic, some are benign while others can be malignant. Serous cystadenomas are benign cystic neoplasms that arise twice as often in women as in men and typically present in the seventh decade of life with nonspecific symptoms such as abdominal pain. They may also present as palpable abdominal masses. Serous cystadenomas are almost always benign, and surgical resection is curative in the vast majority of patients. Mucinous cystic neoplasms almost always arise in women, and in contrast to serous cystadenomas, they can be benign, borderline malignant, or malignant. Mucinous cystic neoplasms usually arise in the body or tail of the pancreas and present as painless, slow-growing masses. The only way to distinguish the entirely benign form (cystadenoma) from its malignant counterpart (cystadenocarcinoma) is pathologic assessment after complete surgical removal. Benign mucinous cystadenomas lack significant cytologic or architectural atypia, while borderline mucinous cystic neoplasms show significant cytologic and architectural atypia but no tissue invasion. Malignant mucinous cystadenocarcinomas have an associated invasive carcinoma. IPMN is a grossly visible, non invasive, mucin-producing, predominantly papillary or rarely flat epithelial neoplasm arising from the main pancreatic duct or branching ducts, with varying degrees of duct dilation. IPMNs usually produce a lesion greater than 1cm in diameter and include a variety of cell types with a spectrum of cytologic and architectural atypia. The unusual solid-pseudopapillary tumour is seen mainly in adolescent girls and young women. These tumours often cause abdominal discomfort because of their large size, and they are usually cured by resection. Surgical resection is the treatment of choice, and although some solid-pseudopapillary tumours are locally aggressive, most pursue a benign course if they are completely resected. Endocrine Neoplasms, also known as ‘islet cell tumours’, are rare in comparison with tumours of the exocrine pancreas, accounting for only 2% of all pancreatic neoplasms. They may be benign or malignant with the ability to spread to the liver and lymph nodes, and it is often difficult to predict the biologic behaviour of these neoplasms. Insulinomas are the most common of pancreatic endocrine neoplasms. They are most often found within the pancreas and are generally small benign lesions. Most are solitary, although multiple lesions have been described. Gastrinomas (Zollinger-Ellison Syndrome) characterised by marked hypersecretion of gastrin and severe peptic ulceration. They may arise in the pancreas, the peripancreatic region, or the wall of the duodenum. Over half of gastrin producing tumours are locally invasive or have already metastasised at the time of diagnosis. Glucagonomas are associated with increased serum levels of glucagon and a syndrome consisting of mild diabetes mellitus, a characteristic skin rash (necrolytic migratory erythema), and anemia. They occur most frequently in perimenopausal and postmenopausal women and are characterized by extremely high plasma glucagon levels. Somatostatinomas are extremely rare neoplasms and are often associated with diabetes mellitus, gall stones and steatorrhea. They are exceedingly difficult to localize preoperatively. High plasma somatostatin levels are required for diagnosis.